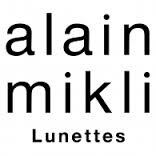 Alain Mikli is a french designer and is known in optics for his collections like Claude Montana, Philippe Starck (also well known as Mikli Starck) and Arnette which are trend setting, and at the same time as provocative luxury products. Unique and very famous are the models Starck Eyes with her screw less bracket system (360° hinge patent). Through the cooperation with the french designer Philippe Starck object a unique new line has been emerged. Handmade designer glasses simple elegance by a dark green round metal frame and patterned temples. Handmade designer glasses simple elegance by a dark green oval metal frame and patterned temples.